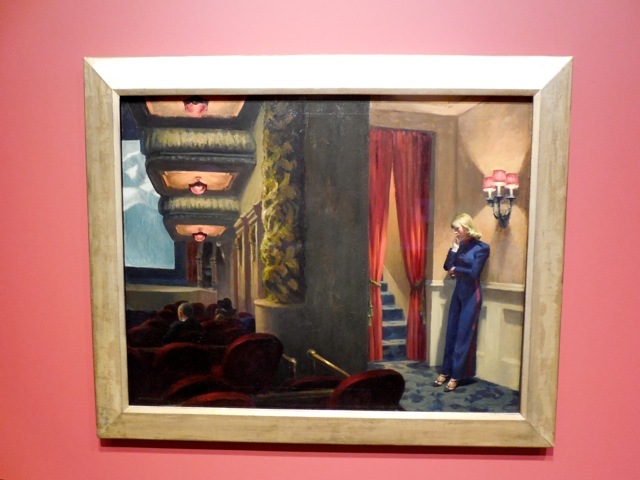 “When there is a Hopper in the room, that’s what you look at.” Elise, the charismatic docent, told us so. A good one pulls us in like a magnet. You can’t turn away from one of the excellent ones. 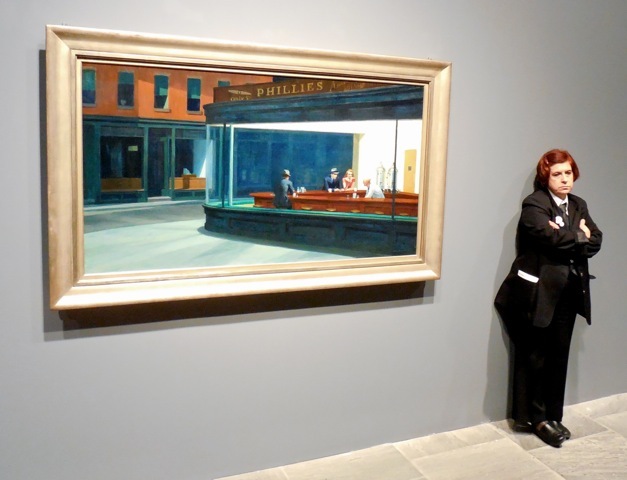 Nighthawks is a prime example, especially if you see it in person. It is electrifying. Four characters are trapped like insects under a florescent lit bell jar at night. There is no door in, Elise’s keen observations, again. Only one door out to the kitchen and you sure don’t want to open that one. His work must have looked very slow in contrast to the Pollock’s and De Kooning’s (the one AbEx guy who’s work Hopper liked) screamed down fourlane blacktops in the 50’s. 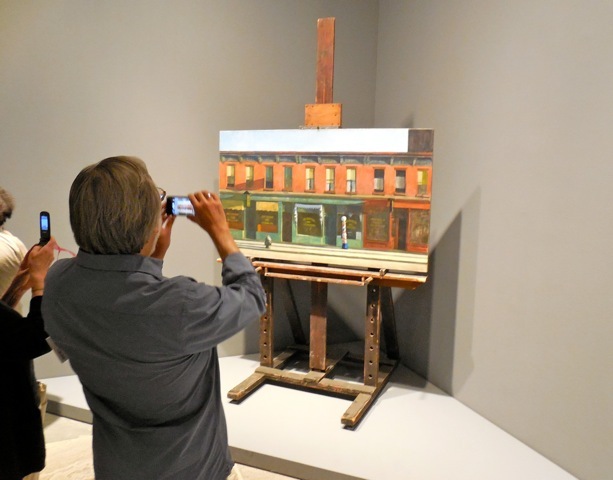 Hopper was the anti “action painter”. Nothing was random, nothing was accidental. Many studies and drawings paved the way. As he evolved he slowly took everything out of the painting. Even people. You are the viewer and part of the scene. He blazed the trail for minimalists. Guys like Dan Flavin, Donald Judd and James Turrell, all the minimalists went to school on his paintings. Hopper’s words were few. A description of the painting would read “a couple and a man being served at a diner”. Famous writers like Joyce Carol Oates have written tales on the picture alone. It’s a voyeuristic view into a life many of us have faced. You begin to wonder what the couple is doing in the dinner. They probably aren’t on a happy date; it’s the wee hours of the night and they are in a deserted empty dinner. The other man is there alone with a coffee with his head down. Who knows what bad things he had done that night? This entry was posted in Uncategorized and tagged Hopper, Joyce Carol Oates, Nighthawk, Pollock. Bookmark the permalink.